Japan-Philippines Defense Relations Under Duterte: Full Steam Ahead? Despite uncertainty about the new president’s foreign policy, defense cooperation is forging ahead. On September 21, the Philippines and Japan convened the fourth iteration of their vice ministerial defense dialogue. The talks saw both countries discuss proposals to deepen their defense relationship despite lingering uncertainty about the future direction of Philippine foreign policy under its new president, Rodrigo Duterte (See: “The Trouble With The Philippines’ Rodrigo Duterte”). As I have noted in previous pieces, while much of the attention on Philippine defense engagements is understandably focused on the United States, a treaty ally, Manila has also increasingly been cultivating other security partners as well, including Australia and Japan. Philippine-Japan security ties in particular had been strengthening significantly under former Philippine President Benigno Aquino III, in part due to common concerns about China’s growing assertiveness in the East China Sea and the South China Sea (See: “Japan, Philippines Declare Strengthened Strategic Partnership”). In March, the two countries signed a landmark agreement on defense equipment and technology transfer, making the Philippines just the fourth country Japan has ever inked such a pact with and paving the way for more defense-related developments. Tokyo has also agreed to provide Manila with patrol vessels and maritime surveillance aircraft. Amidst this backdrop, Tokyo and Manila created the vice ministerial talks back in 2013 to complement their increasingly regularized defense ministerial meetings as well as annual defense talks at the level of assistant secretary/director general, with the first of these being held in January 2014. These commitments have continued under Duterte, in spite of a string of insults directed at the United States and an overzealous embrace of China, both of which have cast serious doubts about the future direction of the country’s foreign policy (See: “The Danger of Duterte’s China and South China Sea Approach”). Officials say bilateral interactions between the two countries since Duterte was inaugurated on June 30, such as the summit meeting between Duterte and Japanese Prime Minister Shinzo Abe, have gone quite well, including on defense cooperation. 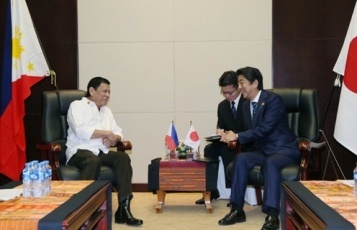 Indeed, during the summit meeting, when Abe reiterated Tokyo’s willingness to boost defense ties with Manila, including through the provision of two large patrol vessels, Duterte expressed his appreciation for what he said would enhance the country’s maritime capabilities (See: “Japan to Give Philippines Two Large Patrol Vessels”). The latest round of vice ministerial talks, held on September 21, provided an opportunity for both sides to further discuss ongoing developments in the defense relationship. Official accounts suggest that several key steps are progressing. For instance, Japan’s vice minister for international affairs confirmed to Philippine Defense Undersecretary Ricardo David Jr. that the defense ministry continues to work on posting an additional defense attaché in the Philippines, a further testament to the deepening of defense ties. Interestingly, the DND account of the meeting also stated that Manila “welcomed the possibility” of trilateral cooperation among the Philippines, Japan, and the United States. Though it did not delve into greater detail, it did mention the fact that Japan has already participated as an observer in the Balikatan exercises – the largest U.S.-Philippine military exercise – as well as Pacific Partnership. While these developments at the working level may suggest that it is full steam ahead for Japan-Philippine defense relations, it is uncertain how these moves will align with Duterte’s own inclinations. Thus far, Duterte’s rhetoric on Philippine defense policy – from his questioning of the need for fighter jets to controversial calls to end Philippine-U.S. military exercises and the presence of American Special Forces in the country – has sparked a mixture of confusion and alarm within the policy bureaucracies and the military, with some rushing to clarify or correct his statements. So far, Japan seems to have been spared, perhaps partly because Duterte’s moves seem to be rooted in his more narrow anti-American outlook rather than disdain for the full network of U.S. allies and partners. For Duterte, the United States has at best a mixed legacy in the Philippines, with its vital role in some aspects of Manila’s security offset by the atrocities it committed during its colonial legacy in the first half of the 20th century as well as the overdependence Manila has had on Washington since. On the other hand, Duterte has a more favorable view of Japan in spite of Tokyo’s own occupation of the country during World War II, largely due to the fact that its economic and security assistance comes with fewer strings attached and touches even the southern parts of the country, including Davao City which Duterte previously managed. But if Duterte’s moves are also designed partly to please China as he seeks a new opening with the country, then there is no telling whether Japan-Philippine defense ties will suffer or at least slow further down the line. If a slowdown does occur, it will likely be limited to certain areas, like maritime security cooperation tied to the South China Sea, given that Beijing is often even more worried about Japanese designs there than it is about American ones. For instance, U.S.-Philippine-Japan trilateral exercises, which had not been a controversial item previously, could be scrutinized more now given Duterte’s comments on drills with Washington. And, though it usually would seem implausible, the idea that the Philippines would not maintain the same level of interest in purchasing Japanese defense equipment further down the line, or, as Duterte previously suggested, source it from other countries like China, ought not to be dismissed out of hand. There’s also the possibility of Manila realigning its priorities for military modernization more generally once again to focus on internal rather than external defense. As Duterte’s first few months in office have proved, even the most basic assumptions in Philippine defense policy cannot be taken for granted as he continues to find his feet. Defense and security issues dominate meeting between Duterte and Abe. Japan Tank Landing Ship Set for Philippines VoyageWhy Japan’s New Military Aircraft Gift to the Philippines MattersWhat’s Next for Japan-Philippines Defense Relations Under Duterte?New Japan Military Radar for the Philippines?More Japan Maritime Patrol Aircraft for the Philippines?